Creating World Class Contact Centres with Cutting Edge Technology, Super Agents & Outstanding Customer Relations. 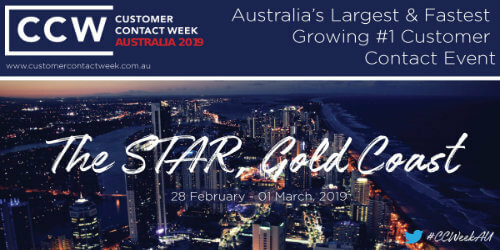 The Australian iteration of the world’s #1 Customer Contact event series from Vegas will take place 28th February – 01st March at The STAR, Gold Coast. Customer Contact Week Australia (CCW) will prove tangible solutions to some of the most current challenges in the contact centre environment. Bringing together 300+ customer contact and CX leaders, CCW will demonstrate through case studies, and interactive discussion, that the innovation of people processes and technology will drive contact centres forward. You’ll be able to customize your own agenda with our tailored track sessions to help you solve the challenges most relevant to your own organization. We hope you will take the opportunity to join us at CCW Australia!